BRITISH FREEDOM PARTY ITS DOORS TO THE LOVERS AND DEFENDERS OF LIBERTY…….. – The Tundra Tabloids……. 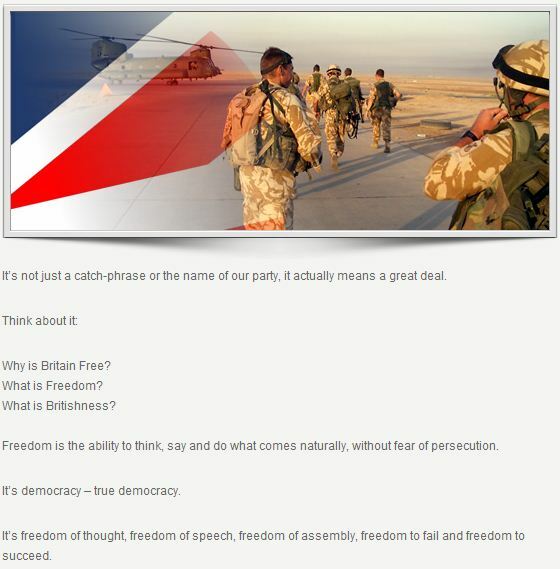 BRITISH FREEDOM PARTY ITS DOORS TO THE LOVERS AND DEFENDERS OF LIBERTY……..
What isn’t there to like about a party whose platform embodies the thinking of such great philosophers such as John Locke, Edmund Burke and Charles de Montesquieu? Members and Ex-Members of the British armed forces have already paid their membership fee for British Freedom and are invited to join the party now. Previous Post Previous Post ISRAELIS WARNED TO LEAVE SINAI DUE TO THREAT OF TERRORIST ATTACKS……. Next Post Next Post CHARLES KRAUTHAMMER OBLITERATES OBAMA’S ‘FAIRNESS TAX’ NONSENSE CALLED THE BUFFET RULE…….